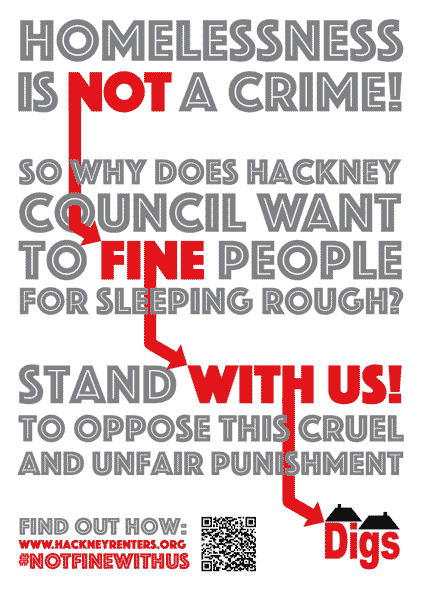 Hackney council have decided in their wisdom to make rough sleeping and begging criminal offences. People found begging or rough sleeping will be fined up to £1,000. Let’s take action against their cruel, unjust treatment that criminalises vulnerable people the council has a responsibility to protect. We’re holding a demo to coincide with the council full Cabinet meeting, to demand the order which criminalises the homeless is scrapped. Tags: events, gentrification, Hackney, Hackney Renters, homelessness. Bookmark the permalink. Well done for your campaign on this. At least five Labour Party branches in Hackney have passed resolutions opposing the use of the Public Space Protection Order against homeless people and a number of councillors have expressed their concerns. Keep up the pressure by writing to individual councillors to encourage them to press the Hackney Cabinet to withdraw the PSPO.